Through exciting, challenging learning that builds upon skills and health and well-being, children can progress, learn new skills and improve self-esteem while participating in inclusive, competitive activities and develop respect for others. For information regarding funding, please see 'reports' tab. We were incredibly lucky to be able to take TWO boys teams to the Adam Heslop cup this year! Both of our teams did amazingly, representing St. Joseph's in the way that I knew they would. I am so proud of each and every single one of them! One of our teams came top of the league, unbeaten in every match! We will be attending the Halifax Finals in the coming weeks - hoping to make it to the regional finals! We had the chance to take a y5/6 football team to play at The Shay Stadium during half time of an FC Halifax game which was incredibly exciting! We did the guard of honour as the players came out and played again Siddal Primary School. We won our match so we have been invited back for the semi-finals against Parkinson Lane! We have been very lucky to set up partnerships with Sacred Heart Primary School in Sowerby Bridge this year to play matches in both netball and football - hosted by ourselves and them. It has been a lot of fun and we are looking forward to continuing over the next term! Year 3 and 4 have now also had the opportunity to take part in the friendly football matches against Sacred Heart this half term. They had their first match this week - our year 3's won 3-2 and our year 4's did very well to be winning 2-0 at half time for the score to finish 3-5 to SH. Well done boys and girls! Two of our KS2 pupils have shown great leadership and intuition and decided that- after taking part in Miss Hall's gymnastic club - that they would like to put on a gymnastics OOSH club for KS1 children on a Wednesday lunch time. To do this, they asked for 50p per week from the pupils the raise money for CAFOD. It has been a wonderful opportunity for our pupils to lead learning under supervision and for our younger pupils to develop their gym skills. The KS1 pupils have thoroughly enjoyed the various activities and Miss Hall has been able to watch both the two KS2 pupils grow in confidence and strength as they led the group themselves - one very proud PE Leader!! Our Year 5 and 6 boys took part in the Adam Heslop cup at North Bridge and did absolutely fantastically! We were so close to the finals - we had the same points as Carr Green but they went through on goals difference. Well done, boys! Year 3 - Rock n Roll! St.Joseph's have had a really exciting project on our hands lately! We have been leading the Deanery Project within our Catholic Cluster. 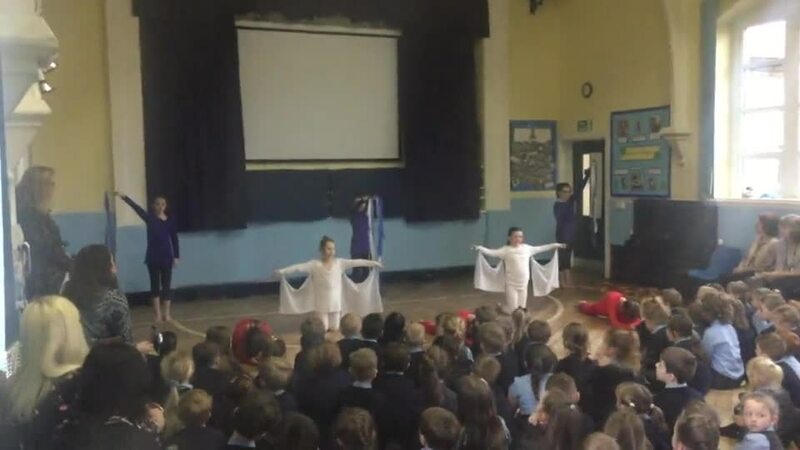 The theme was the gifts of the Holy Spirit and we decided to do this through dance! 16 of our children have been working incredibly hard with Miss Hall to choreograph and lovely piece. We then invited the schools in our Catholic cluster to spend the day in school and they taught the dance to the other children. St.Malachys, Sacred Heart, St.Josephs (Brighouse) and St.Mary's joined us and they all had a fantastic time. We are all super excited about performing the dance in the special mass at St.Bernard's Church in summer! We took part in a whole school race for life! We managed to raise over £500 for Cancer Research and had loads fun doing so! We ran together as a school and each participant received a medal as a reward for their hard work... GO ST-JOSEPH'S! Year 3 showing that they can improve their floor movement skills through focusing on their own personal skills - they have been working hard and the results are there to see! :) Great work year 3 - keep it up! EYFS showing off some of their health and fitness skills whilst in their outdoor provision area! Open ended resources lead to a huge range of activities that are completely child-led. Amazing! Our current year 2 class last year when they were in year 1 - challenging themselves but including throwing and catching balls whilst balancing on a beam! Year 1 love 1K a day! We do it every day apart from Tuesday as we have PE! It is great for our fitness but also helps to keep a healthy MIND :) We work hard to try and improve our previous times each day. We had a very exciting opportunity at St-Joseph's! We arranged a multi-skills OOSH club to be lead by a Huddersfield Town football coach and years 1, 2 and 3 had the first chance to take up the offer! We had loads of fun and managed to work on various skills throughout the 4 weeks. It was a real success and we are looking forward to the year 4, 5 and 6 club next half term! EYFS and KS1 pupils were given the chance to take part in a 'ball skills' club where we focused on different skills and how to control different style balls in a variety of contexts. We played lots of different games where children could work hard to improve their abilities using balls and rackets/bats. We saw some great improvements and had lots of fun! We have just entered the 17/18 Cross Country competition and had our family event at Lightcliffe. We took girls and boys from years 3, 4, 5 and 6 and had a fabulous time! It was great to cheer our peers on and watch as they worked hard to complete the tricky tracks! All of the children did brilliantly and we are very proud to announce that we had 6 children get through to the Calderdale finals! After attending the cross country family event at Lightcliffe - Mia, Lewis and Mason made it through to the Calderdale finals! Amazing!! Year 4 and 5 took part in the Mini Red Tennis competition at North Bridge! We just missed out on getting through to the finals but we had lots of fun!